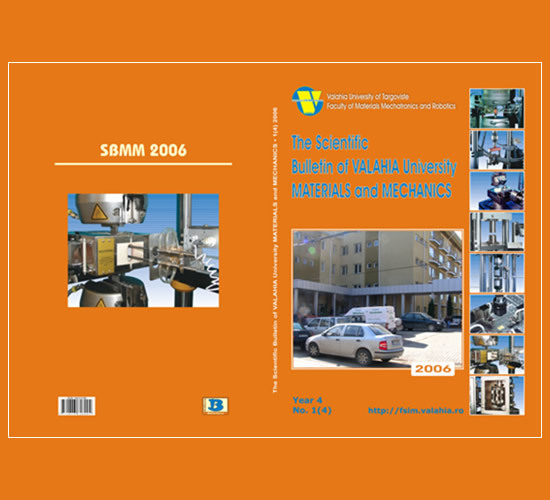 Abstract: Starting from the Zener relation of variation with the temperature of the pearlitic steel lamellas’ thickness, applied to the formation hypothesis of virtual or real pearlitic and bainitic pre-lamellas of α austenite in the period of incubation and considering a mechanism of transformation with continue diffusion it is deduced an theoretically exponential relation for the thickness of the cementitic and pearlitic lamellas and is argumented the validity of Zener relation, also for the thickness of the fragmentation of the bainitic lamellas sub-sub-subunities. Abstract. One of most intensive developed research areas in last 10 years is the so-called “surface engineering”, which carry out research on properties of thin films and surfaces. The films with thickness from 1 to several scores of the micron have exceptionally large application for protection of materials from corrosion, wearing out, thermal influences, light influences, electromagnetic influences,radiation influences and etc. Deposition of thin films affords an opportunity for achievement of materials with unique combination of physical and mechanical properties that have better properties and economical effectiveness. In this connection investigation of nature, functions and properties of new thin films can be used for development of new technologies for future applications. In order to predict the behaviour of thin films it is important to know their material characteristics. Special investigation is necessary, because material characteristics of the deposited thin films are often quite different from those of the bulk material. Abstract. Some aspects about natural chrysotile used as matrices for the adsorption of second generation iron porphyrins are discussed in this paper. Taking into account that NMR broad band technique is a specific method for association processes study, the present paper will treat the main aspects concerning the adsorption of some metalloporphyrins on asbestos. Abstract. Archaeometallurgy is, to some extent, applied engineering in a discipline of anthropology. It describes the properties and production of metal objects from archaeological or at least historical contexts. The goal is to learn how ancient metalworkers may have treated their material for the production of weapons and tools as well as juwellery and coins. Energy dispersive X-ray fluorescence (EDXRF) technique has become a powerful technique for non-destructive multielement analysis of materials. A simple method for the analysis of different stainless steel samples is presented in this paper, which is based on radioisotope excited energy dispersive X-ray fluorescence (EDXRF) spectrometry and does not require any type-standards. Generally in stainless steel (SS) samples Ti(0.03–0.08), Si(0.03–1.1), C(0.03–0.06), P(0.005–0.035), S(0.005–0.012), W(0.02– 0.3%) etc are present as minor components while Cr(32–2.44), Ni(3.7–2.15), Fe(50.0–70.0), Cu(0.6–2.2) and Mo(1.5–4.0%) are present as major components. In the present paper, we present the results obtained with this method for stainless steel analysis which is simple, fast, non-destructive and does not require any type-standards. We have determined elements Cr, Mn, Fe, Co, Ni, Cu, Nb, Mo etc . Abstract. A free-standing film made of a single-wall carbon nanotube (SWCNT)–polyvinylalchol (PVA) composite material was fabricated by pretreatment of SWCNTs in water that promotes unbundling of aggregated SWNCTs. Characterizations using optical absorption spectroscopy, optical microscopy, and thermal analysis revealed that the film has an optical absorption at approximately 1.5 μm, suitable for the occurrence of saturable absorption (a promising nonlinear optical effect) in optical telecommunication wavelengths, and that SWCNTs in the film are dispersed uniformly with a low scattering loss. The experimental results suggest that the nanotubes bundles are well dispersed in the polymer matrix. Abstract. The modern technology of manufacture of high-grade steel by the L.F. process (ladle-furnace) considering both the increase of melting unit and the increase of high-grade steel by the improvement some physico - mechanical properties.The typical physico-chemical processes, which take place between the metallurgical phases are produced due to injection some strongly desulphurized powders colligated to injection of inert gas Ar together with the electromagnetic continuous swirling of metal. The efficiency of metallurgical processes consists of strongly decrease of the sulphur content from metallic both that ascertains the increase some physico-mechanical properties: tensile strength and resilience; by comparison with the steels obtained by classical technologies. Abstract: This paper presents technological solution to improve the cleanliness indicators of some tool alloyed steels. Using the existent equipment (a classic electric furnace and a VOD installation) we intended to obtain a particular slag composition (in the system CaO-Al2O3-SiO2) and to use it in an efficient manner (for desulphurization and inclusion control), having in mind the simultaneity with the processes like aluminothermy or vacuum heating. Abstract. The paper presents few aspects concerning of the new alternative iron making technologies in Romania. A few reasons are analyzed for the apparition and development of such technologies in the world steel market competition. The presence of altenative iron making technologies will be a benefit for metallurgic, economic, social and environmental reasons. The preliminary researches made using wastes from chemical and metallurgical industries are encouraging for developing alternative iron making pilot plants. Abstract. The attainment of the objectives regarding the increase in competitiveness of the products in the European economic space becomes a reality by means of the use of the transfer technology lines designed within a modular, flexible system. Comprising innovative concepts, this mechatronic equipment is mainly based on the utilisation of materials with highly used features. This paper presents the structure and main features of the Mechatronic Equipment with Cartesian Robot – EMRC Type which is included in the area of the research for improving product quality by the utilisation of the state-of-art technologies. The paper develops new intelligent processing and transfer techniques for products like carcasses. Abstract. The work has for goal presentation of the realizations of the National Institute for Research and Development in the dental medicine domain. Presentation of a modular system for implantation and prosthetics for cranial face and jaw surgery, dental implants and associated instrumentary, and also the preoccupations regarding composite materials for dental medicine. Abstract. This work contains a basic presentation of planetary mills (called also satellite mills), their functional principle (based on the centrifugal field of forces) and theoretical basis of this kind of mills. There also can be found the relations between constructive and functional parameters, required by a well suited design. Finally the numerical computations comparison between planetary mills and classical tubular ones proves their high performance. The numerical computations also show a way of approaching the computations. Abstract This article presents a new approach of the classical grinding theories: Rittinger, Kick-Kirpicev and Bond. This new approach facilitates the practical applications of the theories and improves even their efficiency. The numerical example presented below for the specific case of grinding shows that this operation is usually made with a very low efficiency: under 1%. Abstract. In this paper is presented the analyze of the displacements states for a plane plate and a ribbed radial plate, for observing the advantage of the rigidify. The plates, of the same dimensions, are solicited at 0, 3 MPa pressure. For comparison, we used the analytical, finite elements and experimental methods for the plane plate and for the ribbed plate, we used the finite elements and experimental methods. Abstract. This work deals with the solution to a problem regarding the plane section in polyhedrons and the development of the geometrical element determined by these sections, for example in a pyramid. Abstract. The column Industrial Robots type represents a large used category, starting with the period of the beginning of automatic flexible manufacture. Preponderantly, these column industrial robots are used largely in manipulation operations of a different spares with small and medium dimensions, in general, with regulate forms, which is processed by splinting methods in flexible cells ready in star or circular way of the components. Abstract. Critical power systems, such as data centers and communication switching facilities, have very high availability requirements. Even a momentary interruption of two seconds may cause a loss of two hours of data processing. Consequently, power quality has emerged as an issue of significant importance in the operation of these systems. In this paper, we address some issues of power quality like: real-time detection and diagnosis of power quality problems, reliability and availability evaluation, and capacity margin analysis. The objective of real-time detection and diagnosis is to provide a seamless on-line monitoring and off-line maintenance process. Capacity margin analysis helps operators to plan for additional loads and to schedule repair/replacement activities. Abstract. In the paper is presented in a very detailed manner the proof of the calculus formula of the absolute velocity and absolute acceleration in case of the relative motion of a particle. The method is based on matrix calculus. First one will express the particle coordinates relatively to the fixed reference frame using a matrix relation. Then this relation will be derived with respect to time and in this way we will obtain successively the formulas with the aid of which we may compute the absolute velocity and the absolute acceleration respectively. Abstract. The paper presents a method of dynamics survey of the physical pendulum which from mechanical point of view is a system with two degrees of freedom. This method is based on matrix computation and it consists in writing the equations of motion for each solid rigid body which compound the system as if it were free. Then these equations of motion will be assembled taking into account the constraint forces. The method may be extended to any systems with three or more degrees of freedom as well. The physical pendulum with two degrees of freedom whose dynamics survey is shown in the paper serves only as a model of the application of the method.